Booking an appointment for an existing Client in Nookal can be done with just a few clicks! There are 2 easy ways to rebook an existing Client. See below for details. 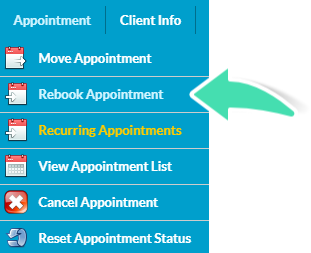 When rebooking an appointment this way, the appointment will default to the same Case and Service of the selected appointment. If this is not what is required, open the New Appointment and change the Case/Service and Save Changes. 1. 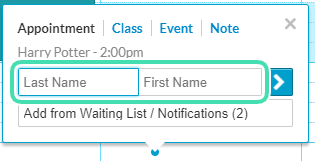 Click on a previous Appointment to open the Appointment window. 5. In the pop-up warning that opens, click No to book one appointment only or Yes to continue rebooking appointments for this Client. 3. Enter the First Name and/or the Last Name of the Client in the appropriate field. 4. 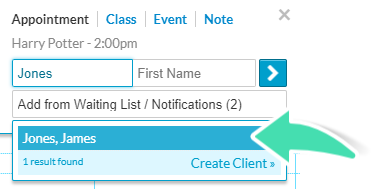 Click on the appropriate Client in the list of Clients that match the name. Confirm it is the right Client with the date of birth displayed on the right if in the Client Profile. 5. If required, select a different Case or Create a New one. Click here for further guidance on Cases.